They say that cleanliness is next to godliness, but it seems like Fox News host Pete Hegseth didn’t get the memo. In a recent broadcast, he had no qualms letting his viewers know about his highly questionable hygiene habits, as he confessed on air that he hasn’t washed his hands for about 10 years. “My 2019 resolution is to say things on-air that I say off-air. I don’t think I’ve washed my hands for 10 years.” he said, totally unprompted. As his colleagues began to laugh and co-host Jedediah Bila said, ‘someone help me’, Hegseth rubbed his hands together while reaffirming his stance on the matter. The 38-year-old then stated that he ‘inoculates’ himself and implied that he doesn’t get sick because he’s immune to everything. This is going against the established theory from the scientific community that washing your hands regularly is one of the most important aspects of disease prevention. The Center for Disease Control and Prevention would disagree with you there, Pete. Failure to wash hands contributes to the spread so much that hand washing could protect almost one out of five young children who get sick with respiratory infections like pneumonia. Due to the fact that his co-hosts seemed comfortable enough sitting near him, we’re assuming that Pete has had plenty of showers and/or baths during this ten years. However, the hand thing is still gross, and the internet thought so too. 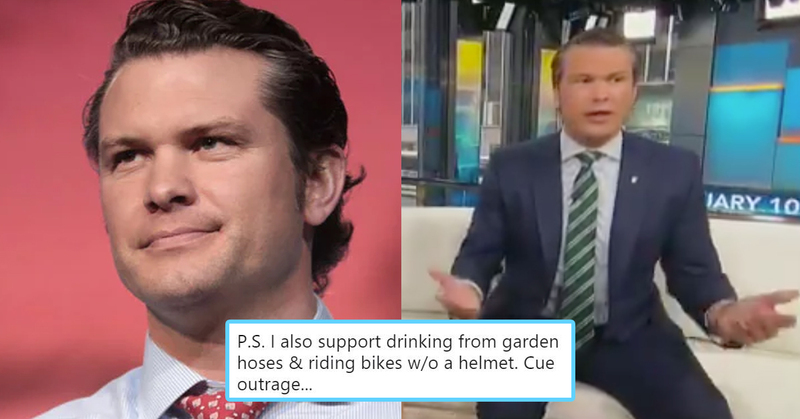 Following the negative attention he received, Hegseth tried to save face and told the media to ‘loosen up and have some fun’ because his health is ‘doing well’. Hegseth has since come out and stated that he was joking, retweeting others who have said people simply don’t get his humor. Sounds like a backpedal to me! Regardless of whether it was a joke or not though, people are still disgusted by the thought of it and referred to the TV host as ‘nasty’ and ‘beyond gross’.